Discover the Networks | William Lacy Clay Jr.
William Lacy Clay Jr. was born in St. Louis, Missouri in July 1956 and grew up in Silver Spring, Maryland. His father is the veteran politician Bill Clay (born 1931), who served as Missouri’s First-District congressman from 1969-2001. While working as a staffer in the House of Representatives, William Lacy Clay Jr. attended night classes and earned a bachelor’s degree in political science from the University of Maryland in 1983. That same year he returned to St. Louis, where Democratic bosses backed his successful run for a suddenly vacant seat in the state legislature. Seven years later Clay was elected to the Missouri state senate, and he served there from 1991-2000. In 2000, Clay’s father retired from the House of Representatives and left his political machine and most of his contributors – including more than 30 influential union locals – to his son. As a result, William Lacy Clay captured 61 percent of the vote in a six-candidate Democratic primary, then won the general election for the First-District seat in November. One of his campaign advisers was the unionist and Communist Party USA affiliate Lew Moye. 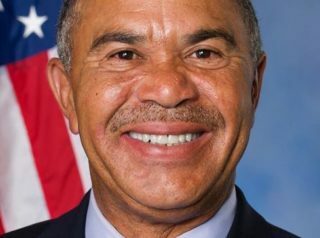 In the House of Representatives, Clay became a member of both the Congressional Black Caucus (CBC) and the Congressional Progressive Caucus (CPC). In his numerous political campaigns since 2000, Clay has continued to receive strong financial support from the members and political action committees of large and powerful labor unions like AFSCME, the National Education Association, the American Federation of Teachers, the AFL-CIO, the Teamsters, and the Service Employees International Union. In April 2005, Clay supported a 19-day sit-in by the Washington University (St. Louis) Student Worker Alliance, which demanded that the school’s contract employees (who earned $7.50 per hour) be paid a living wage. The effort ultimately proved to be successful when campus officials agreed to commit at least $1 million over the ensuing two years toward higher salaries and better benefits for the workers. Later in 2005, Clay became a member of the Out of Iraq Congressional Caucus. Throughout his career in Congress, Clay’s voting record has consistently been 85 to 100 percent on the left side of legislation, according to Americans for Democratic Action. Click here for an overview of his votes on numerous key bills. In 2014, Clay and his fellow CBC members reacted with outrage to two separate white-police-vs.-black-suspect altercations that resulted in the deaths of the blacks involved, and became the focal points of a massive, nationwide protest movement alleging that white officers were routinely targeting African Americans with unjustified use of force. The deceased were a 43-year-old New Yorker named Eric Garner and 18-year-old Michael Brown of Ferguson, Missouri. “These tragedies have illuminated, with the harsh light of truth, the deep divisions and very real disparities that we have yet to overcome as a nation,” said Clay. In early January 2019, Clay announced that he would join several dozen fellow Democratic congressmen in boycotting president-elect Donald Trump’s inauguration. The lawmaker said that he would be “back home in St. Louis speaking to school kids” instead. Further Reading: “William Lacy Clay Jr.” (Votesmart.org, Keywiki.org); “Victory for Wash U Students in Living Wage” (People’s World, 4-29-2005); “Black Caucus: Whites Not Allowed” (Politico, 1-22-2007); “Racism of the Congressional Black Caucus” (World Net Daily, 1-26-2009); “Clay Salutes 2016 Congressional Art Competition Winners” (press release, 5-6-2016); “DC Law Enforcement Demand Removal of Capitol Painting Depicting Cops As Racist Pigs” (Daily Caller, 12-30-2016); “Rep. Hunter Removes Painting Depicting Cops As Pigs from Capitol Wall” (Daily Caller, 1-6-2017); “Clay Won’t Attend Trump Inaugural” (St. Louis Post-Dispatch, 1-13-2017).